Unfortunately, construction is sometimes unavoidable when you're behind the wheel, especially during the Spring and Summer months. And while it's easy to get frustrated when you get stuck in construction, it's important to understand that construction is necessary to keep our roads safe. Unfortunately, many are hurt and injured in construction zone accidents every day as a result of drivers not following some important construction zone safety tips. Follow these tips to help improve your safety, and the safety of construction workers, when you are driving through construction zones. Any time you enter a construction zone, it's important to increase your following distance between other cars. Ideally, you should have between two and three car lengths between you and the car in front of you, which will give you adequate time to stop if you need to. Abrupt stops are common in construction zones, so following any closer than two or three car lengths could easily result in you causing a rear-ending accident. Increase your following distance even more in slick or foggy conditions. A lot of times, you'll see signs for a reduced speed limit through a construction zone; in some cases, the posted speed may be even lower if workers are present. Even if you don't see any obvious construction workers, it's still imperative that you obey the posted speed limit signs. Never assume that just because you don't see workers right now, that they won't be working a little ways up the road or that the speed limit doesn't apply. Not only will speeding in a construction zone put workers at risk, but you could also receive a hefty fine for doing so if you're caught by police. Sometimes, flaggers will be posted in construction zones (especially in residential areas) to help direct traffic around the work area. Usually, if this is the case, there will be signs posted that read "flagger ahead" or something similar. Make sure you are on the lookout. 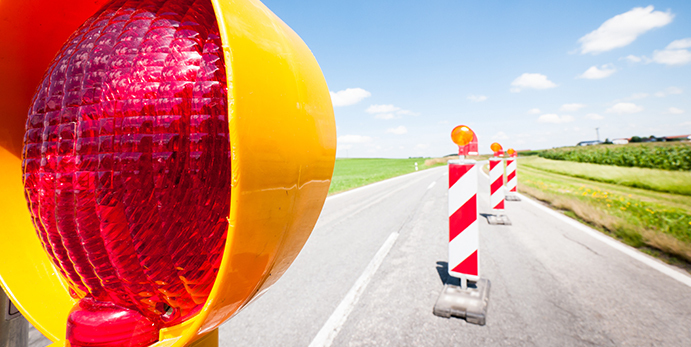 Always obey instructions from flaggers, and assume that their instructions overrule any other traffic signs or signals. Their directions might not align with normal traffic patterns, so be prepared. Also, be on the lookout for flaggers' signals, such as an extended palm indicating that you need to stop. Be sure to also reduce your speed and be especially aware of your surroundings when driving near a work zone with flaggers posted. Distraction-free driving is always important, but this is especially important when you're driving in a construction zone, where it's imperative that you're on high alert. When you enter a construction zone or see that one is approaching, turn down (or turn off) your radio, end any cell phone calls, and keep both hands on the wheel and eyes on the road. Now is not the time to be fidgeting with your radio dial or checking your Facebook page on your phone. One of the most common causes of accidents and road rage in construction zones is that of lane closures. When you see a sign posted for an upcoming lane closure, be sure to merge as soon as safely possible. Do not wait until the lane is coming to an end to force your way over into the next lane over. This is not only rude to the other drivers who followed the posted signs and merged when they were supposed to, but it can also be dangerous if you cut somebody off or even cause a road rage incident. Construction zones can be frustrating and dangerous to navigate, but all drivers have a responsibility to keep themselves and other drivers safe while behind the wheel. Be sure to keep these tips in mind the next time you find yourself needing to navigate through a construction or work zone, and consider taking an online traffic course for increased driver safety.